Black people in England and Wales are less likely to have illegal substances found on them than white people in stop-and-searches, analysis suggests. The findings came as the Inspectorate of Constabulary reported "troubling" revelations that black people are eight times more likely to be stopped. It urged officers not to stop people simply because they smelled cannabis. The National Police Chiefs' Council said it was looking at why young black men are disproportionately stopped. Police officers can use stop-and-search powers if they have "reasonable grounds" to suspect someone is carrying items such as drugs, weapons or stolen property. Reality Check: Are fewer black people being stopped and searched? The NPCC said stop-and-search powers were important "with rising knife and gun crime", as well as being a deterrent for people considering carrying out acid attacks. But the England and Wales police watchdog said: "Its (stop-and-search) disproportionate use on members of black, Asian and minority ethnic communities continues to threaten trust and confidence in the police." When the report examined the subset of drugs searches, it said the "find rate" was 33% where the person searched was white, and 26% where they were black. 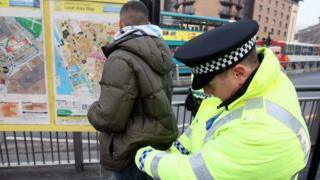 It analysed more than 8,500 stop and search records. Officers were given guidance last year that the smell of cannabis, on its own, would not normally justify stopping and searching someone, but the Inspectorate of Constabulary said many officers were unaware of this. Out of the 8,500 searches, almost 600 were conducted solely because police could smell cannabis. Searches based on other grounds, such as the suspect's behaviour, result in more arrests, the report said. NPCC Deputy Chief Constable Adrian Hanstock said that forces were "making good progress" ensuring the powers were used legitimately and fairly. He added that police were working with the Home Office and the College of Policing to understand why young black men "are disproportionately reflected not only in stop-and-search figures". Mr Hanstock added that police also needed look at why black men were "victims of violent crime and across the criminal justice system as a whole". PM speech: Are fewer black people being stopped and searched?